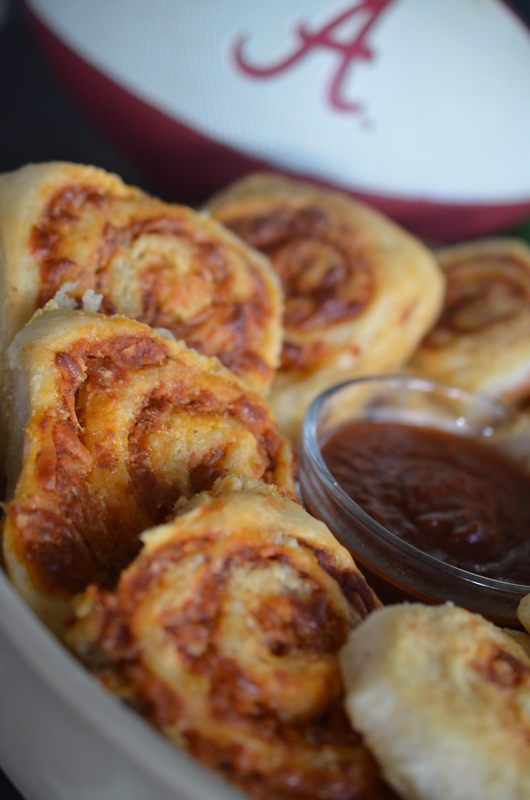 The Art of the Pizza Roll, Tailgate Chefs- Game On! Game Day, Game Day, Game Day!! College Football is Kicking Off!! I believe in the Football/Tailgate Cuisine Movement, support it 100%! I love the playfulness of the food, the comradery it inspires between guys and their grills, the artisanal care that nonchefs are putting towards the pop up tailgate table. The craft direction is strong within this mouthwatering cuisine. It is downright hard to find someone that does not have fond memories of tailgate food. Thank you Emily for the deliciousness, for the loving tenderness you put towards this football food recipe. In a stand mixer with a dough hook attachment place the flour, yeast, and salt. Quickly mix together the dry ingredients. Pour in the oil and hot tap water and stir for about 10 seconds. The dough should be wet enough to leave a little residue on the side of the bowl at this point but not so wet that it’s gooey. Adjust if needed with a little flour or tiny bit warm water. Knead for about 5 minutes until the dough is smooth and elastic. Dough should be tacky to the touch. Do not add any flour or water after the dough is done mixing. In a deep oiled mixing bowl, place the dough ball and place plastic wrap or damp towel directly over the dough. Allow to rise until doubled in size, I set mine outside in the warm air, but near a window, or even a warm oven will do. Once risen, punch dough to deflate it. Make pizza crust according to directions and let raise once. After it has risen, turn it onto a counter sprayed with cooking spray and roll it out thin, in the shape of a rectangle. 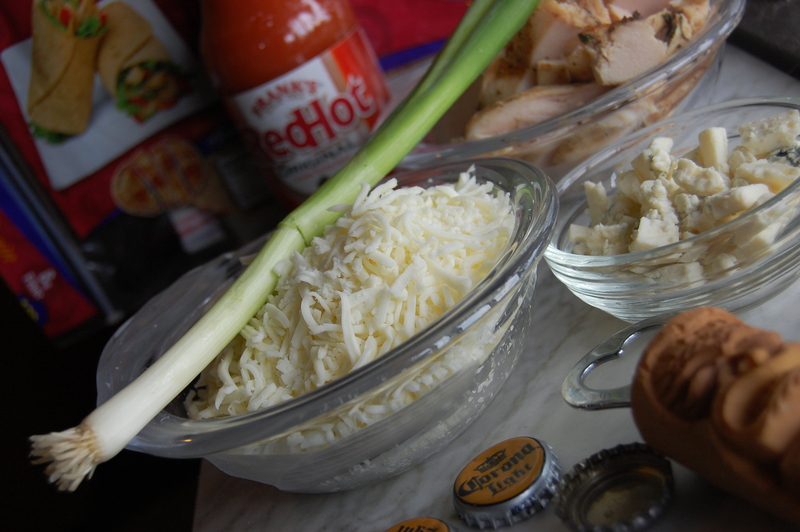 Spread sauce; you may only need 1/2-3/4 cup but you can use the rest for dipping after the rolls are cooked. 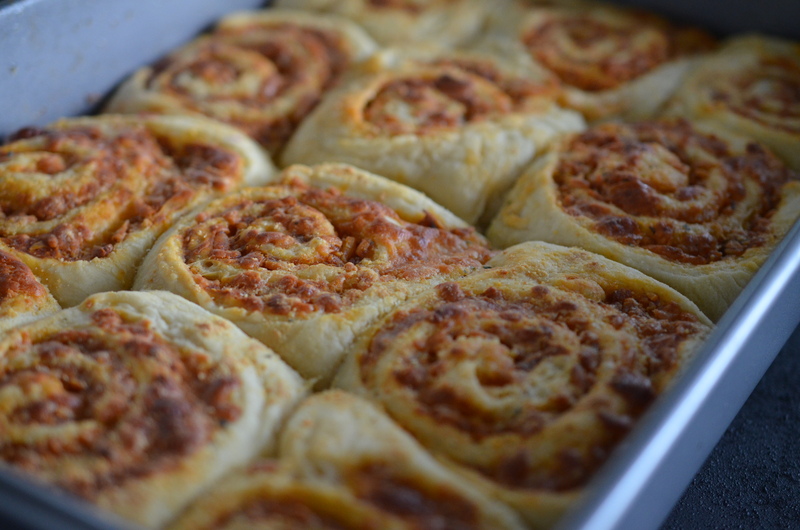 Add cheese and start rolling the dough tightly in a neat line. 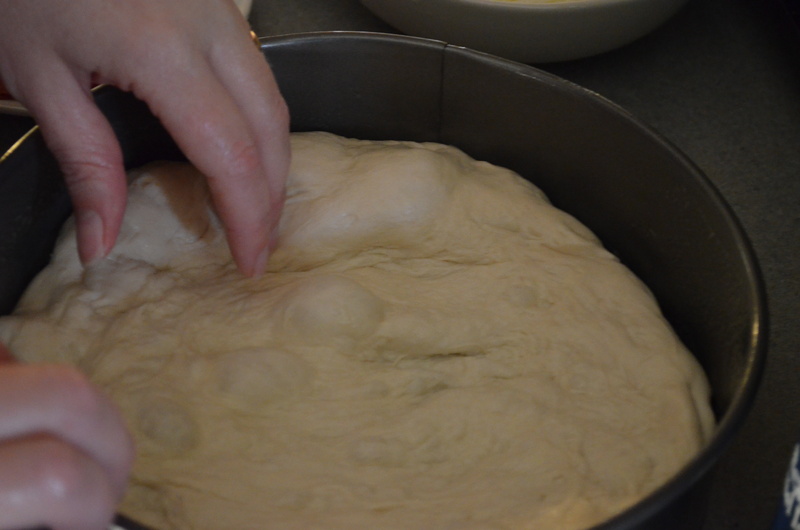 When there’s about an inch of dough left, stop rolling and pull the edge up and over, pinching it closed. With a serrated knife, gently slice about 1-inch thick. 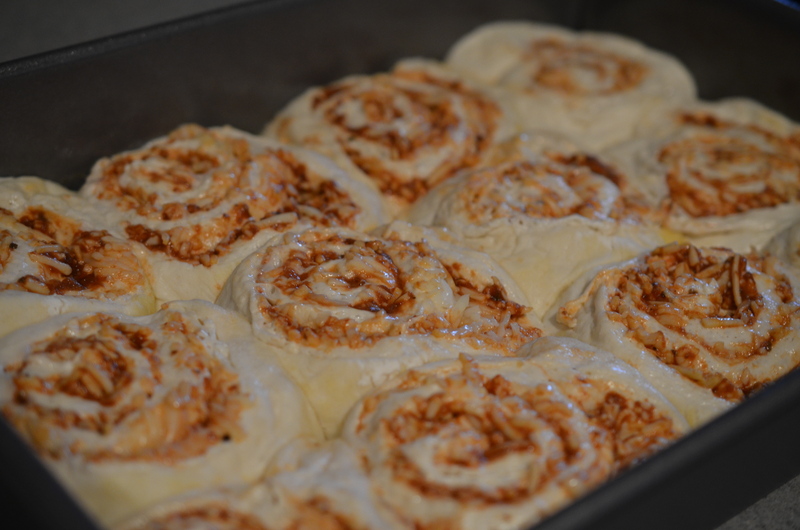 Lay the rolls in a 13×9-inch baking pan, sprayed with cooking spray. 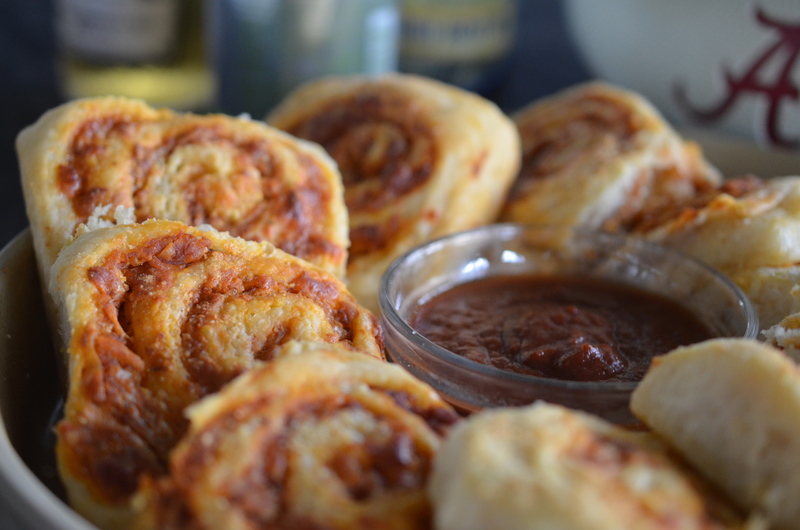 You should get about 12 rolls out of the dough. Cover lightly and let the dough rise again until about doubled. Preheat oven to 375 degrees. Combine melted butter and garlic bread seasoning and brush over the tops of the rolls. Bake for about 17-20 minutes. Serve warm either plain or with extra pizza sauce for dipping. 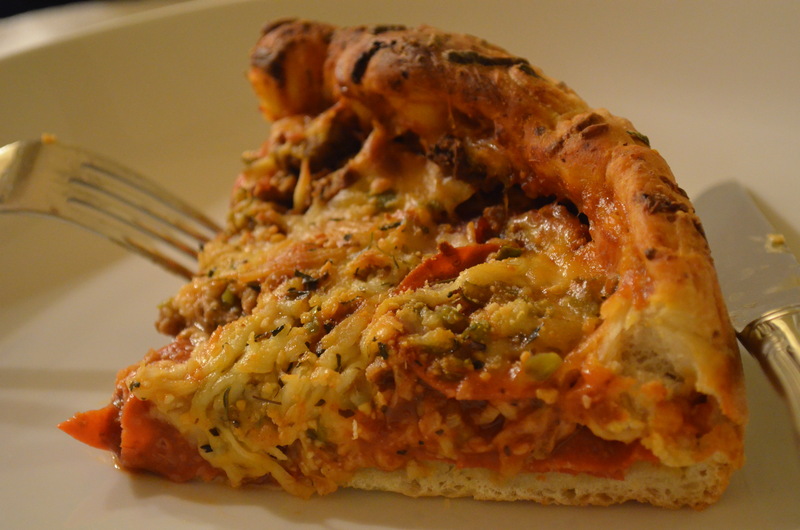 Reheat any leftovers in the same fashion you would with leftover pizzas. Or if you are taking to the tailgate party, wrap them in a sheet of foil and warm them on a low heat grill. We are heading out to the Alabama and Virginia Tech game today and can’t wait to see what we find at the lot full of tailgate parties!! Roll Tide! This is a dish from my brother, Sir Ryan’s South Carolina kitchen that has been talked about for a few years. Over time he has worked on convincing me to give it a try, and though it sounded fabulous and I wanted to make it, it just never happened. While Ryan and his family were visiting over the Christmas holiday he put one together and proved that this pie was all that. We couldn’t resist giving it another try ourselves a few weeks later and for once the tables turned and I found myself calling the novice chef brother of mine for advice. 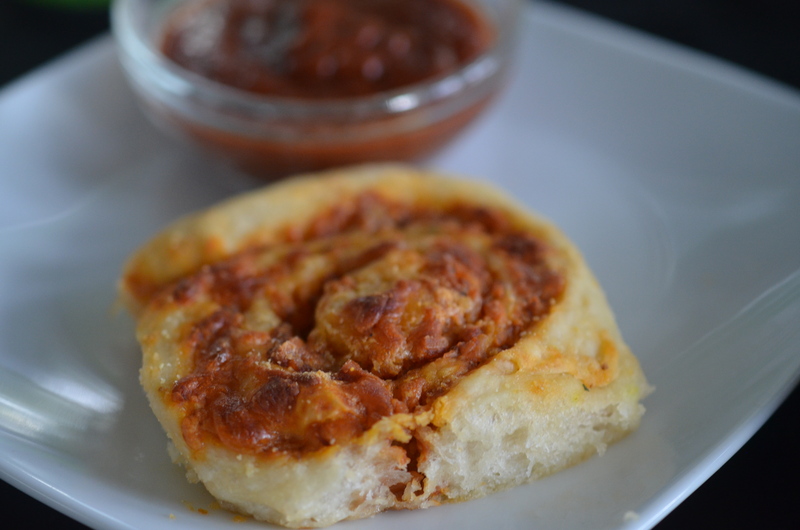 Make this as simple or complicated as you like, buy premade dough or make it fresh yourself, buy pizza sauce or create your own. For me this is a fast, decadent meal, and I prefer to keep it that way. Maybe if I had some Jersey tomatoes available I would make my own sauce. Preheat oven to 350. Sauté the garlic, peppers, onions and basil until fragrant and set aside. Gather the remaining mise en place and 9” spring form pan, or another deep round pan you have in your kitchen arsenal. Coat the pan with olive oil and dust the parmesan cheese evenly around the surface. Place the dough ball in the pan and push the bulk of the dough towards the edges. 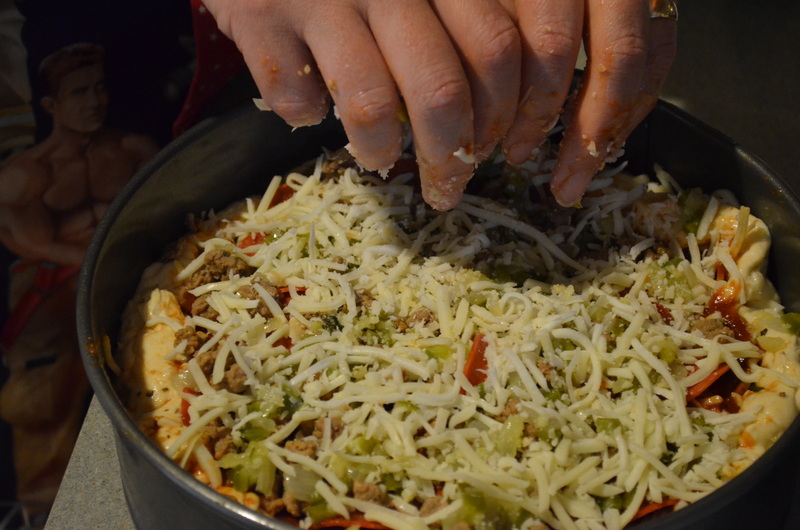 Start the layering process with a sprinkling of shredded mozzarella, followed by the pizza sauce and then the meat and vegetable toppings. 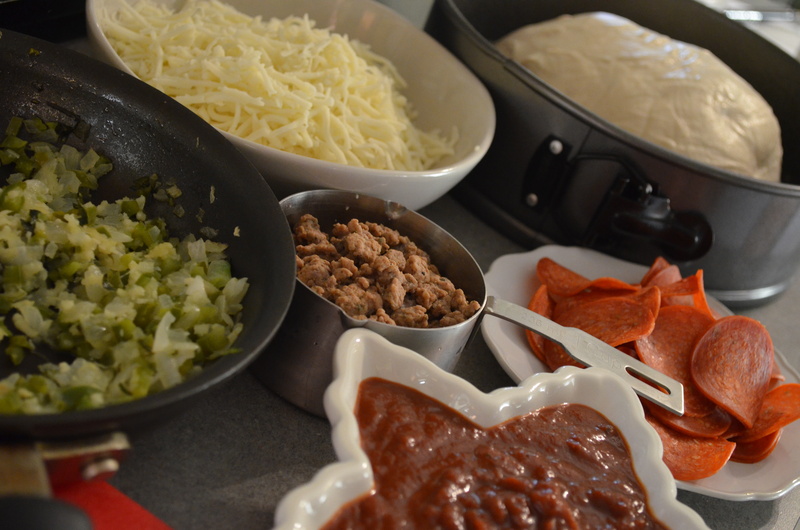 Apply pressure to the toppings, causing the dough to move towards the edge and grow up the pan. 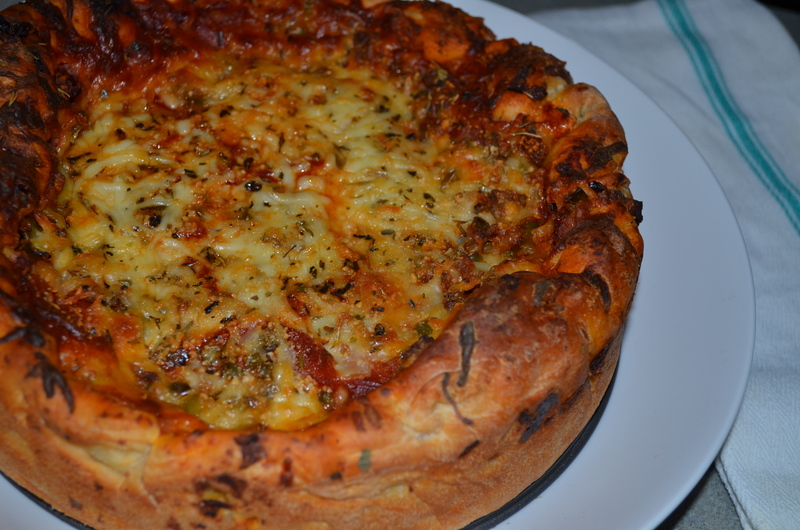 Top with cheese and layer in the same order, each time pushing down to move the dough up the sides of the pan. End the layering with a healthy amount of cheese and a dusting of parmesan. Bake for 60- 70 minutes, getting the top to be bubbly, golden, mouthwatering perfect. 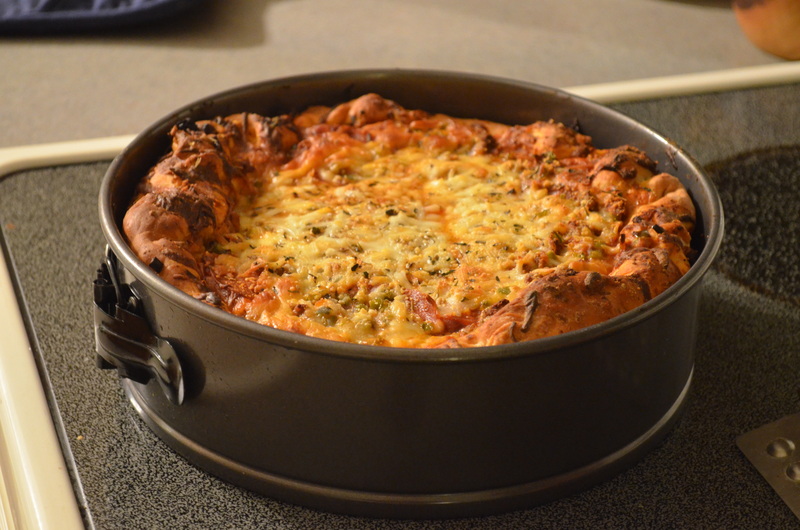 This is a pretty massive deep dish, certainly enough for 4 filling servings. After removing it from the pan (the spring form pan makes the removal so easy), the pie just looks sinfully irresistible. 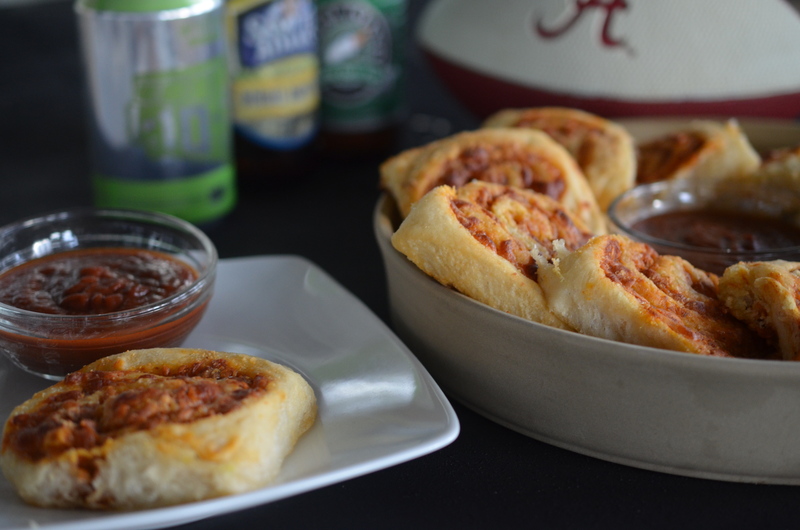 Easy for a big game, a Friday family night or even a hump-day perk. Just a reminder that you can learn from anyone- Thanks Sir Ryan for treating us to this amazing pie! 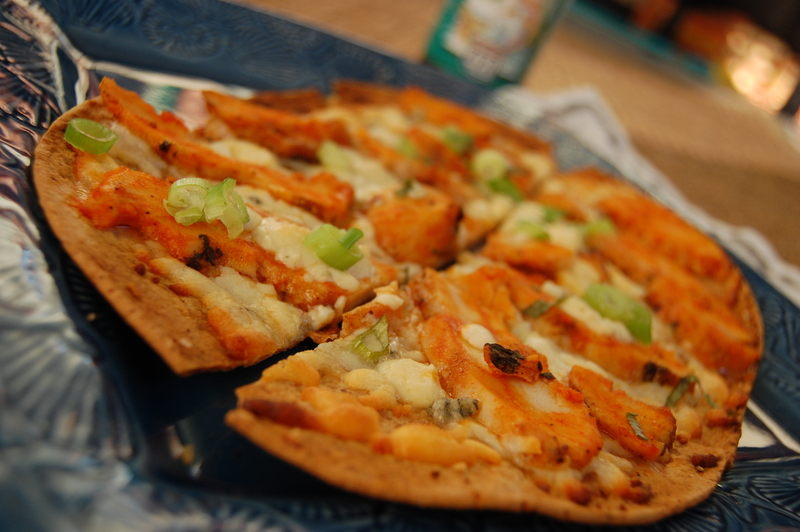 Buffalo and Blue Flat Breads- Game Day Fever! Buffalo and Blue Flat Breads! Sir Wes has huge affinity for wings…he loves them and would like to eat them every day if he could, especially during football season. It’s not just NFL Days either, he is a HUGE Alabama fan too, so his appetite for wings is frequent….and it is our waistlines that pay the price. To protect our waistlines I try to answer his thirst for wings in a healthier manner- as long as the flavors are there, he is satisfied. 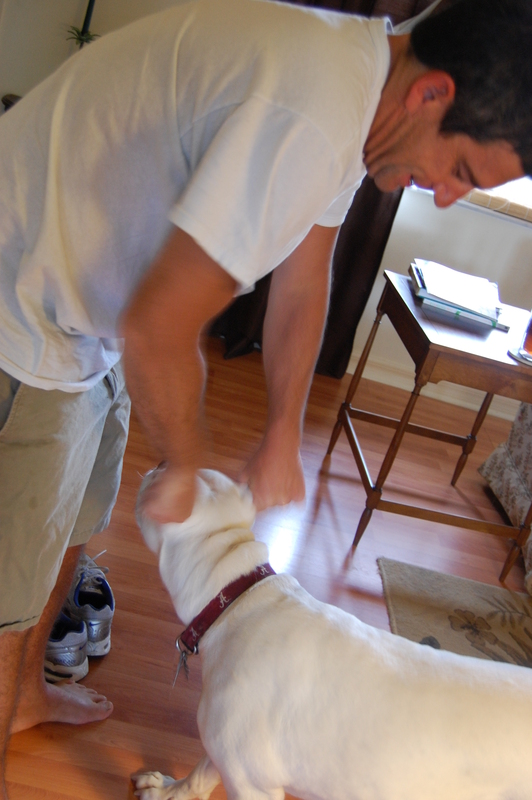 Sir Wes and Sir Duke- Even Duke has Bama Fever, see his collar! These flat breads are quick and easy, some days I make my own pizza dough, but I like the ease and low calories of “Flatouts”, most grocery’s have them close to the deli counter. I grilled the chicken the night before while I was using the grill so it was even easier, just putting them together took me about 10 minute. These can also be assembled at your tail gate parties and cooked on the grill, a great alternative to burgers and brats! Mis en place, simple and easy! Flat breads are ready for the oven! Preheat the oven to 375. Spread a teaspoon of olive oil on each flat bread and sprinkle with kosher salt and fresh ground black pepper. Gently spread 1/2 cup mozzarella cheese over each flat bread. 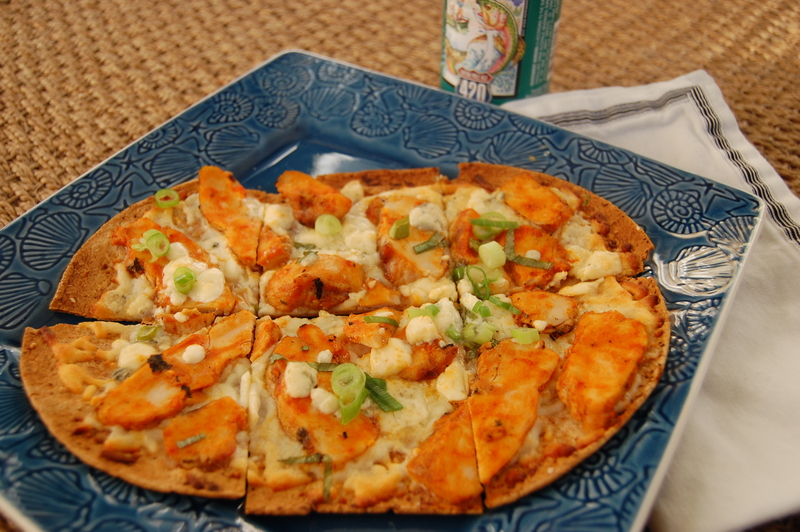 In a bowl toss the slice chicken with the buffalo sauce and spread evenly over the flat breads. 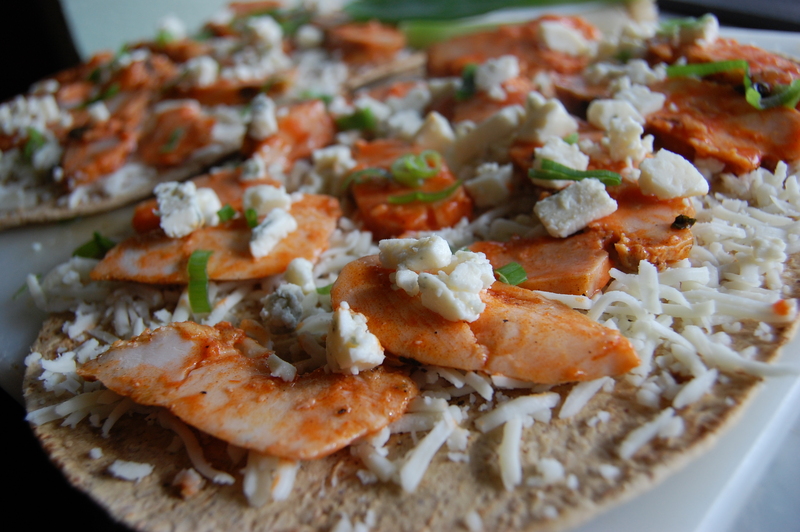 Spread the blue cheese and green onions over the flat breads. If you have a pizza stone, bake directly on them, other wise place flat breads on a cookie sheet and place in oven for about 10 minutes or until the edges are golden brown. Cut, serve and enjoy! Buffalo and Blue Flat Breads!! Satisfying to the wing cravings and keeping your waistline in check!